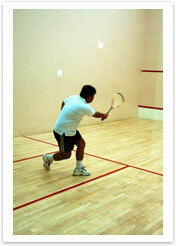 Nomad's has two squash courts catering to not just the individual players but also a very active section competition. Both courts have overhead fans and glass paneling to the entrance of the court for spectator viewing. Courts are available throughout the day and nite and there is training and squash development people which can assist in the development of young players. For badminton enthusiasts, there are 2 courts and the section has regular play times nominated.